Ten years ago, my dad wanted to buy an affordable compact camera and I asked him to get the Olympus Mju II as I had just read an article in a French magazine called Chasseur d’Image in which the camera had had a very positive review. He got one. Ten years later (i.e. a few days ago), he finally took the plunge and got a digital compact camera. 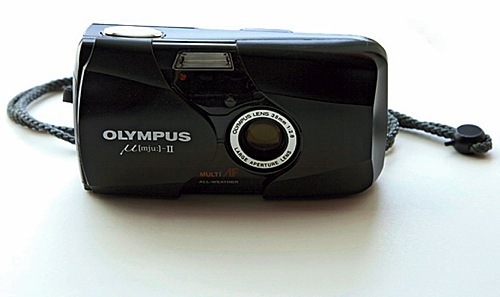 And he did something excellent: my dad gave me his Olympus Mju II as a gift! I kept the Mju II on a table wondering whether I should bring it back to life… and I succumbed. I am proud to say that I have now gone back to basics: I have bought a roll of Fuji ISO 200 and got a new CR-123A battery. Now that the Olympus is alive and raring to go, I’ll be taking some photos over the next few days with it. Then I’ll have the film developed. Then I’ll scan the negative and, only then, will see (and make you see) the results. Patience is a virtue, they say. I have to say that I’m loving to be patient. Like in old times. That would be a golden opportunity to learn how to develop films, don’t you think? Setting up a dark room and getting your own pics out of the roll, sounds interesting to me. Nah. I’m too old for that. Digital is so much more practical. This is vintage stuff , give us a shout when you post the pictures.